Andiamo! provides a complete conference interpreting service to organisations in the UK and overseas. We ran a 2.5 day training event for over 100 European sales people with simultaneous interpreting from English to German, Italian and French. I was very impressed with high quality, flexibility and adaptability of the interpreting team from Andiamo! Our content was medical and at times technical, with a range across strategic marketing, clinical and sales from a range of accents and speeds. The team provided excellent translation and daily feedback. We also had Andiamo! take care of the AV needs and this service was excellent with a Sound Engineer who went well beyond the contracted terms to ensure our event was successful. I would use Andiamo! again. Everything you need to host interpreting at your conference is included in our service. Conference interpreting is a term often used to describe the simultaneous interpreting that takes place at a conference (or at an event with a similar setup). Conference interpreting can involve either just one language or even multiple languages – all of which are interpreted at the same time. 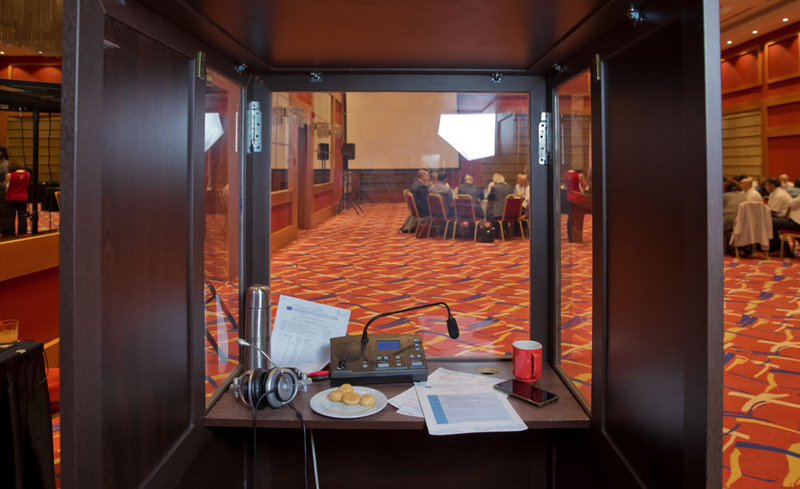 Your conference interpreters carry out the interpreting from a soundproofed booth where they interpret exactly what the speaker is saying, in real time, to the conference delegates via headsets. They work in pairs, swapping every 20-30 minutes due to the intensity of the work. Not sure what type of interpreting equipment you need for your conference? Find out more on our equipment page or call one of our friendly team on 08450 345 677 and we’ll be happy to guide you.